PA Flavor showcases Pennsylvania breweries, restaurants and food producers in a unique sampling event. It is presented jointly by the Brewers of PA, the Pennsylvania Restaurant & Lodging Association and the American Culinary Federation's Harrisburg Chapter which represents the best chefs in the area. Now in its 9th year, PA Flavor has grown to include an enhanced Designated Driver area, a Mixology Bar during VIP Hour sponsored by The Traveling Tap, and a DJ spinning great music. 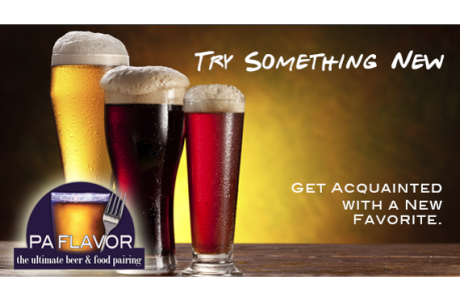 PA Flavor takes place during Harrisburg Beer Week, April 26-May 5, 2019, a nine-day, multi-venue series featuring breweries, restaurants and pubs throughout the greater Harrisburg area. Many beer festivals do not include food,but PA Flavor does! Ticket holders will enjoy small plate appetizers from many area restaurants not to mention many PA craft beers, distilled spirits and ciders.